Saturday night, I found myself following the frenzy that was deemed by many dramatic internet users "LillyGate" and "BoycottTarget" and a few hashtags I don't care to mention thanks to particularly nasty language. If you were lucky enough to be in bed and unaware of the madness that was the Lilly for Target launch, let me attempt to fill you in. Several months ago, Target announced their next designer collaboration: They'd be releasing an exclusive line of clothing, accessories, and home items from the infamous Lilly Pulitzer. In the true darling nature of the internet, many responded with mixed feelings. While most were thrilled with the opportunity to buy her classic prints at an affordable price point, many were disgusted at the possibility that "basics" would be demeaning the name of their beloved Lilly. Excuse me while I go pick up my eyes, they rolled out of my head and across the room. It's a well known fact that designer collaborations with big box stores mean big $$$. Not only does it open up a brand to a new fan base, it creates a frenzy around a limited-edition collection. It's a win-win collab, honestly. 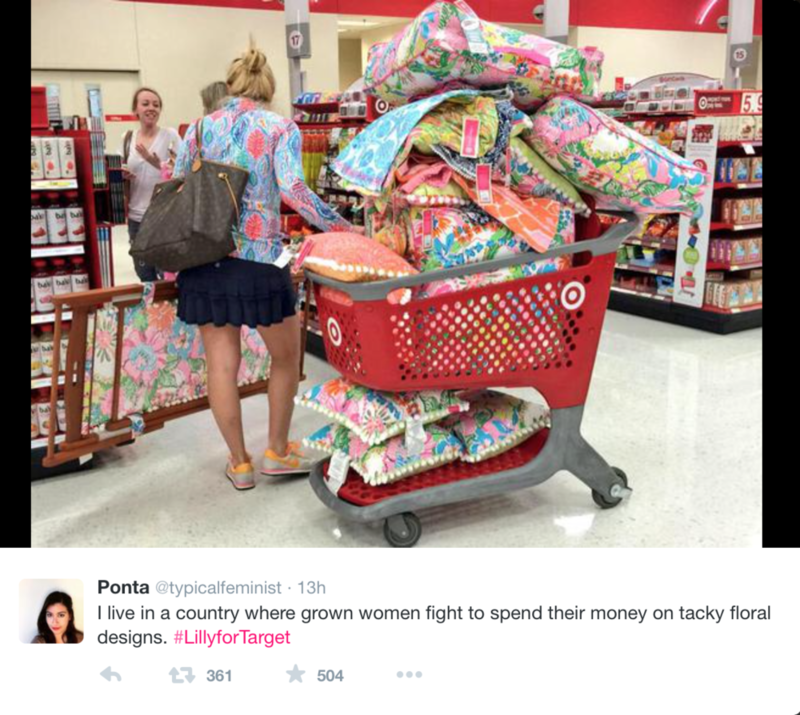 Target makes a ton of money and sells out of a 250-item collection in mere minutes, Lilly Pulitzer creates a new fan base that reconsiders paying $250 for a dress that they may have not even been interested in before. So what's the problem? Well, the millions of basic prep girls flogged to Twitter and Facebook around midnight in anticipation of a launch. The President of Target.com did what I consider GREAT social media and lived on Twitter for the evening answering people's questions and giving more details and updates about the launch. He was hailed for this early on, but when Twitter started leaking links to items released early (mistakenly or buggy, we'll never know), Twitter took an immediate 180 and turned on their former savior. The man with all of the info now became the victim of bullying by 100's of self-entitled women who believed they'd been cheated out of pineapple sandals and giraffe print pants that basically look like pajamas. What happened next was a series of unfortunate events that I was thrilled to be awake for. While half of the internet population bragged about their hauls and getting everything they wanted thanks to the glitch, the other half went BAT. S#!T. CRAZY. These launches are supposed to be fun! Sure, they're a little competitive, but it's not the end of the world if you get the pink dress instead of the blue one. You'd think that would be the case - but now these women all start pointing the fingers at poor Target. They blame the website, they blame the president, they blame Lilly for even agreeing to it. They start a hashtag saying they'll NEVER SHOP AT TARGET AGAIN. Sure, okay. Y'all go try to buy toilet paper and a bathing suit at Walmart. We'll see you in like A WEEK. Things continue to escalate. The site goes live briefly at 2 am and I manage to snag some pineapple sandals against my better judgement. Honestly, I wasn't even interested in Lilly before this point but I do like pineapples and the situation had me hyped. Plus, I wanted to see exactly how difficult it was to order. Even after forgetting my password and having to route through PayPal, I managed to get a confirmation email. At this point, the site goes down completely and Target says it's doing maintenance. It'll be another 30 minutes to an hour. So everyone waited patiently, right? HAHA! No, it was more pitchforks, torches, and foul language from the self-professed "classy" crowd. Now the East Coasters are whining that it's past their bedtime. I suspect most of these women are hangry, in the middle of shark week, or sleep deprived. In the middle of all of these complaints, bloggers start tweeting their affiliate links in a mad power struggle to pay for their hauls. This is actually what upsets me the most - these girls are linking to items that are either pulled from the store, sold out, or they're just landing on the Lilly for Target page. If anyone were to click that link thinking the store was up, that blogger will make a commission on their purchase. It's fair game, yes. But is it ethical? The entire thing is giving me the uh-ohs. Items start popping up on eBay at this point. The internet is understanding of the process of capitalism, of course. JUST KIDDING! That starts an entirely new rant subject. At this point, I am truly fed up. People are acting like spoiled rotten brats because they weren't handed everything they wanted on a silver platter. I'm tired and it's 3:30 am, so I called it a night and looked forward to the morning tweets about the store chaos. In the morning, I found myself even MORE disgusted by what everyone is saying. "Why didn't you have enough stock?" "Three minutes later it's all gone!" "HOW DARE YOU TARGET, I HAD $$$ of DOLLARS TO SPEND, YOUR LOSS!!" An instagram account called BoycottTarget has been made to report the injustices done to all white women across the US today. Everyone's calling this a #Nightmare. I tweet something along the lines of, "If the worst thing that's happened to you today is that you couldn't order the color of dress you wanted, you're using the word nightmare wrong." So what went wrong? Well, the first problem is that some people forgot the good old meaning of Supply & Demand. Anyone remember "guns and butter" from Economics 101? Target intended to cause an uproar. They never wanted to have enough stock, they wanted to sell out in minutes. Target releases cute clothes every day that sit on the shelves for months because there's no hype created around them. These designer collaborations create an odd vacuum where women are willing to stand in line, stay up all night, and fight each other just to get a piece of something they probably would have NEVER bought in the first place, had they not felt the urgency. Have you ever thought about the urgency created around these limited-edition collections and flash sales? Apple's been using this tactic for years. Hundreds of thousands have lined up for an iPhone with each release, whether they needed a new one or not. By limiting the stock and creating a hype around their products, they've made it so that going and claiming your new Apple product is a ritual, not a chore. Employees high five you on the way out the door! News stations report on the first iPhone sold! What we've done is made an environment where people are cheered for their purchases, where people feel they have "won" something simply by scoring this unobtainable product. eBay tapped into this power a long time ago. I remember commercials that basically stated that it feels better when you win something, rather than just shopping. Pop-up shops and Sample Sales have been using the power of "limited supply, limited edition" for decades! The fact is, all of those things will end up at another retailer down the line if you don't buy it at a sample sale, but we all still line up around the block to get a shot at "the ultimate deal." Then came flash sale sites like Gilt and HauteLook that made their sales only a day or two, with limited supplies. Were you looking at a Rebecca Taylor tee yesterday? Absolutely not, but this one is on sale for 75% off! And this skirt matches it perfectly! These short-term sales have created a response in our brains that makes us think we need ALL OF THE THINGS, when in reality, we could have lived without knowing about any of the collaborations. But that's the beauty of marketing, isn't it? I work for an advertising agency, and our sole job is to make you feel like you're connecting with a business or product in a way that makes you feel like it will change your life or you can't live without it. Advertising isn't evil - it's a job and a career for many that we don't want to destroy. But understanding the difference between actual want, need, and just fabricated desire is important for those of you who don't want to end up explaining to your husband why you spent $700 at Target on a Sunday morning. Honestly, I don't know what to tell you. What I've seen the past weekend has made me ill. From the women cutting down everyone shopping the collab (and calling it #LillyForPoors) to the women who felt they were cheated out of what was due to them, I'm a little annoyed that it had to go down this way. Fashion is fun, no doubt. But when it reaches this level of consumerism, I have to wonder if "scoring" the deal is worth the struggle. For those who were burned by this collaboration, give it a few days. Everyone will start returning the items they feel buyer's remorse over, or the things that don't fit, or the stuff that was a major impulse buy in the heat of the action. Keep your eyes out on Poshmark and Instagram Shops for original Lilly items that are gently loved and being sold at a fraction of the price. Seek out new and local designers that speak to your personal aesthetic to create a truly unique look. Because remember - every girl is going to be wearing the same outfit to work, brunch, and church this week. Grown women will be dressed the exact same as little girls and you're bound to run into at least one unfortunate soul who was only able to snag a towel and is still wearing it as a dress. And by Thursday, we'll all be obsessing over the next chance to buy a bunch of stuff we never knew we needed.